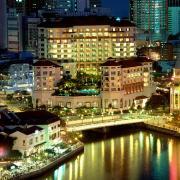 Swissotel Merchant Court hotel has a total of 476 rooms spread over 12 floors. Amongst the hotel's facilities are a foyer with a 24-hour reception desk, a hotel safe, lift access and a currency exchange facility. Furthermore, there is a restaurant and a bar and, for an additional fee, guests may use the laundry and room services as well as the parking. The hotel also has its own business centre with workstations equipped with high speed and wireless Internet access. It is possible to take advantage of both for an ad.